Silistra city and hotels in Bulgaria. Location: Silistra is a town situated on the right bank of the Danube River, 442 km northeast of Sofia. The land border between Bulgaria and Romania starts from Silistra. This is a city with rich history and today is a regional centre. History: The region around Silistra was inhabited centuries before Christ, but the first written sources are from the Roman chronicle from 106 year, that mentions the name Durrostorum- “fortified town”. The rest decades of Roman inhabitance continue strengthening, and the town grows and gets attractive. The fortified system, the water conduct system and draining system, street net, villas, Roman buildings, residencies, baths, ovens and cemeteries. After the end of the Roman Empire the town falls under Bysantiym rule. After the establishment of Bulgaria 681, the town is in the borders of the country and is called Drustar. In 1388 it was conquered by the ottomans. This does not affect the ethnical population of the city and its inhabitants are mainly Bulgarians. During the 15th century it bears the name Silistra and develops as a boat construction centre in the Ottoman Empire. After the liberation the bourgeois class forms in the town. From 1913 to 1940 it was part of Romania, and than it was returned back to the territories of Bulgaria forever. Sightseeing: The very well preserved Roman tomb from the 4th century is of great cultural- historical significance. Parts of the ancient Roman wall were discovered in different parts of the town. The very well preserved Medjidi Tabiya fortress, completed in 1853 is extremely interesting. 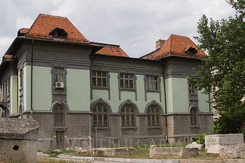 The historical and ethnographic museum in the town gives detailed information for the history and lifestyle in Silistra. The Thracian rock cult complex called “Badjaliyata” and is in the picturesque canyon. A visit in the biosphere reserve “Srebarna” just 16 km from Silistra is unforgettable experience. 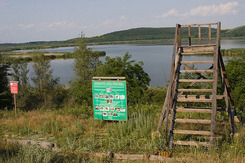 The nature here is unique and the reserve is listed in the UNESCO list. Boat trips along the Danube river and other attractions along the float of the big river. The hotels and restaurants in Silistra are countless and open to welcome guest. You should not miss to try the local delicious cuisines and wines from the region.